So here's a thing that is happening now I guess. Selfie tattoos. Tattoos of your selfie. Permanently marking your skin with a memento of that time you took a blurry picture of yourself in a bathroom. We honestly don't even know where to start with this one. First of all, why did you pick a blurry bathroom picture. 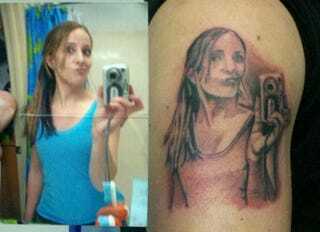 Girl, if you're gonna get a tattoo of your selfie (which we still do not recommend), at least use a better photo. If there is any silver lining, it's the fact that she knew well enough to have the toothbrush and shower curtain cropped out on the body art.Second, why are you using a camera? Nobody takes selfies with cameras anymore. That tattoo is already outdated. But hey, whatever makes you happy! There are probably worse tattoos to get. Maybe? UPDATE: Thankfully this is apparently NOT a selfie tattoo. It's just a dude who got a tattoo of his ex-girlfriend's selfie tattooed on him. Is that better? I don't know.